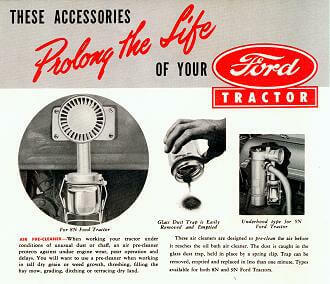 The cyclone or “turbine” style air precleaners have always been a popular option on the N-series Fords. The incoming air is swirled and the heavier dirt particles are deposited into the glass jar where they can be emptied later. 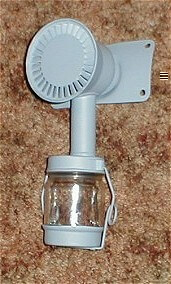 The regular oil bath air cleaner doesn’t need serviced nearly as often with the precleaner in use. Available as an original dealer installed Ford accessory, the precleaners were made by the Air Cleaner Service Company of Lincoln, Nebraska. On the left is the 8N model. On the right is the 9N-2N model. 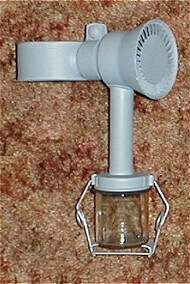 Original jars and bails for the cyclone precleaners are scarce. 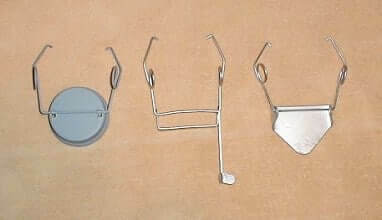 The bail on the left is the early style cup type. The bail in the center was the later type and is the most common. The bail on the right is a non-original replacement available today. There were at least 3 types of jars used. One plain, and one with a band around the center. 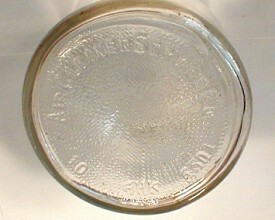 Both carried the Air Cleaner Service company name molded in the bottom of the jar. The third was a 1/2 pint Atlas brand mason jar.